Modern art forms are characterised not only by openness and lack of formal structure but also by spontaneity and freedom from definition by traditional authorities. Conceptual art is regarded as the most modern or post-modern form of visual art in the 20th Century yet the explosion of ideas which took place at its origins a hundred years ago has lost much of its impetus and originality. Although openness and lack of formal structure are still maintained, spontaneity and creative confrontation with traditional expectations of the nature of an art work have been replaced with unimaginative conformity with authorities in the art world. Any attempt to break with the traditional Greco-Romano conceptualisation of a work of art as an object stripped of magical or religious significance that can be owned and held in a museum, art gallery or private collection is the aspect of modern art which is most likely to bring an artist into conflict with traditional authorities. How such conflict is resolved is an important part of the Living Work of Art project which will always be a “work in progress”. The conflation of artist and art work is the most radical aspect of this form of conceptual art since the definition of the identity of the artist goes beyond the control of artistic authorities. In industrial and post industrial societies human identity is defined by and controlled by all- powerful secular state authorities. Confrontation in this case will therefore take place not between the conceptual artist and the art-loving public, critics and gallery authorities, but with a much less appreciative adversary. 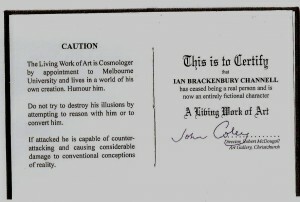 In 1970 the Living Work of Art began the deconstruction of his identity as a person in the legal sense of the term and commenced living according to creative principles. Allowing such obvious secular state documentation as a bank account, driving license, social security number and income tax registration to expire, it was as if the previous real person had himself expired and was reborn as a fictional character, “The Wizard”. This particular role enabled him to avoid alienation from all systems of identity as he enthusiastically maintained his loyalty and commitment to the Queen whom he saw as a mainly non-secular aesthetic being, set apart from the secular state. 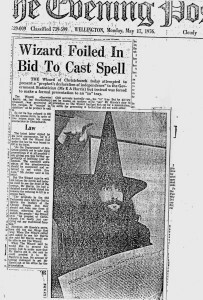 The link between a monarch and a wizard is an important part of the foundation myth of the British national identity known as “The Matter of Britain”. From now on his interaction with other individuals had to be very different. His knowledge of role theory as a sociology academic was as important as techniques in drawing etc to a conventional artist. Unless an individual needs something from the secular state institutions there are very few occasions when their identity is questioned. Completing forms as a fictional character is obviously not acceptable. Coping with those occasions when the state demands to know all about the personal identity of people in their legal territory, regardless of whether or not the individual needs their services, is where the Living Work of Art is at “the cutting edge’ of conceptual art. Real Life Transformed into a Drama Created by The Living Work of Art. The five yearly census held by the New Zealand Department of Statistics produced three occasions when the social creativity of The Wizard was stretched to its limits.. 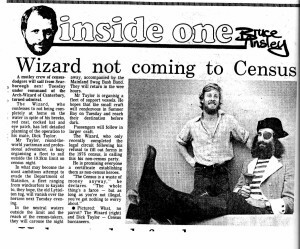 The first confrontation was in 1976 when The Wizard travelled to the capital Wellington to see the Chief Statistician with a document giving his reasons for avoiding filling in a census form. Firstly as a sociologist he believed that the government only needed to use a census to establish the number of people in the country and their age and gender. All other information would be better obtained through professionally carried out random sampling; censuses are notoriously unreliable. Secondly there were strong religious reasons why holding a census was an evil act. The English Parliament delayed holding one until after the French Revolution and Napoleonic wars had radically changed the balance of power between Church and State. Most importantly of course were his personal needs to preserve his delicate creation of an aesthetic identity from destruction. 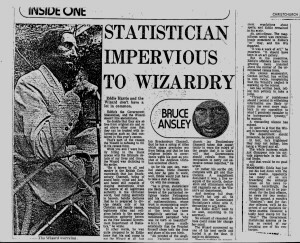 The Government Statistician refused to see The Wizard who cast a well-publicised spell on him. 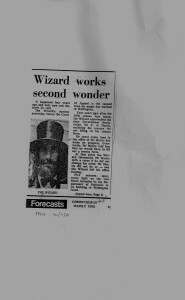 Years later it transpired that as the Wizard left the building all the lights fused for several hours! 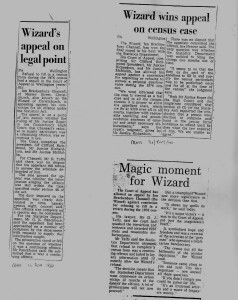 A year later The Wizard was charged and to great public amusement the drama went on four years going through the High Court and finally the Court of Appeal where The Wizard won the case on a technicality which forced the government to amend the law. No sooner had The Living Work of Art survived this attack on the legitimacy of his artistic creation when the next census approached. This time, 1981, he took a sailing boat out to sea and was twelve miles off the coast by midnight on Census Eve. He was accompanied by close colleagues and a well known radio broadcaster who transmitted news back to the national radio station. Everyone knew where The Wizard was but he was “out for the count”. Again he was taken to court, this time the well-paid team of government lawyers was determined to make an example of the only individual who had beaten them during the last census. He was fortunate to have the free services of a good friend who was an excellent lawyer. The courts found that the government had no legal authority to enforce compliance beyond the twelve mile limit. The Living Work of Art escaped again and the general public were delighted, a very unusual reaction to a conceptual artist’s creativity. Five years passed, it was 1986 and another Census was due. The Wizard informed the government and the mass media that this time he would use his magic powers and “vanish” at midnight and reappear at noon the next day. When he re-appeared his beard was slightly darker! The Secular state authorities were not amused nor were they convinced that he had vanished. This issue now became one of “faith”. Would the people of New Zealand believe The Wizard had vanished? 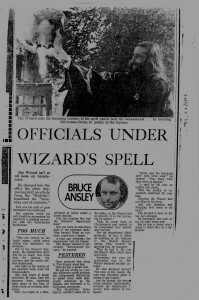 Through the mass media he let the people of New Zealand know that if they did not believe he had vanished he was obviously not a wizard in their eyes. He would give up his quixotic delusion and return to real life. He threatened to go back to his previous occupation as a lecturer in sociology. This proposal was not welcomed by the public. He went on strike and to the disappointment of locals and tourists alike did not continue his regular appearances in Cathedral Square. 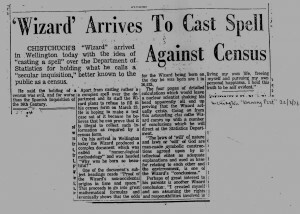 Having built up the tension The Wizard took out space in the major newspapers to publish petitions asking people to fill in their names if they believed The Wizard had vanished on the day of the Census. He also produced thousands of stickers bearing his image and the words “I Believe the Wizard Vanished On Census Night” which found their way all over the country including a large number in the offices of the Department of Statistics. 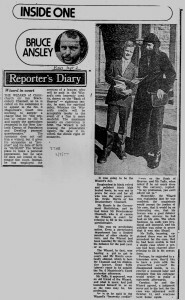 The volume of public support was considerable and many respectable people signed their names to the petitions including mayors, priests and members of parliament. Another successful outcome. 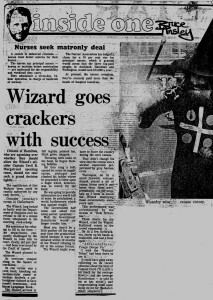 The Department quietly let the matter drop and The Wizard, confident in his magic power to create reality, resumed his robes and daily performances in the city centre. 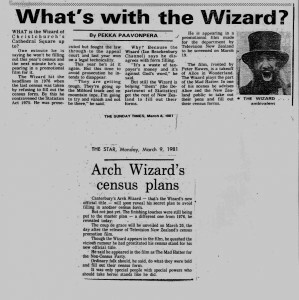 In 1991 a moratorium was jointly declared by The Wizard and Department of Statistics. No comments were made by either side. Peace reigned. How does this dramatic story lasting over 20 years differ from a novel, play or film? The Living Work of Art is unique in the history of art in being thoroughly modern in its openness, spontaneity, and radical break with the traditional Greco-Roman concept of art whilst being playfully successful in defying attempts to make art subordinate to the authority of powerful secular authorities. Even more unusual is that it is not popular with most art critics nor conceptual art collectors but has heroic status with the general public. The artwork’s “crowning” triumph was being awarded the Queen’s Service Medal as “The Wizard of New Zealand” in 2009. The photo-gallery is an exhibition of the dramatic story as the newspapers chose to show it.